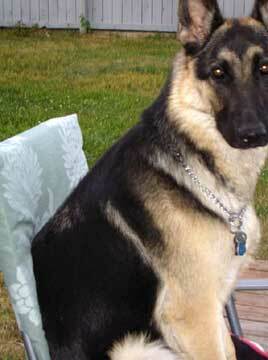 Fun Dog Tricks - Find The Object, a great trick to teach your German Shepherd. Teaching your dog how to do any kind of Dog Tricks is a fun way to spend quality time with your dog. Training your dog anything new not only stimulates his mind but also increases his ability to analyze information. The entire process of learning will help stimulate your dog both mentally and physically. Did you know that your dog is capable of learning hundreds of words as long as you apply patience and consistent training? For example, in the following trick called "find the object", your dog will learn how to identify a toy or a particular item by its name from a group of items. This is a very entertaining game that will widen your dogs vocabulary and as well as activating his thinking process. • First off, line up several different objects on the floor or a short table and ask your dog to find any one specific item. It's best to start off with an item that he's already familiar with, such as his favorite toy. • Next, put that particular object that you've chosen in an obvious area right next to one or two other unfamiliar, boring objects, such as a book or a block of wood. • Now, point to all the items on the floor or the table and ask your dog to "find the toy". As soon as your German Shepherd picks up the right object that you asked for, praise him immediately and immensely. If your GSD knows how to fetch, have him bring the "item" right to you. • Next, add another familiar item to the line (such as a ball). Now command him to find the new item. Once he has done this successfully switch back and forth between the second object and the first one a few times. • Don't overdo it! After you've tried this game of find the object for 5 - 10 minutes stop with your dog completing the trick correctly! Give your dog a break and do something different - practice an old trick you already know well, play a game of fetch or keep away, but just do something different. • Practice this again later on in the day or the next day. Add one new item every time your dog gets really good correctly picking the items you've asked for several times in a row. Very important: Don't scold your dog if he happens to pick the wrong thing. It's a good idea to ignore the wrong ones and not to reward the dog for that choice. Once your German Shepherd has mastered this trick, you can try a more advanced variation by placing objects in a different location or another room and then telling your dog to find the object.